The federal government developed programs to provide education, health care, and other services to migrant farm workers and their children in the mid-1960s, when residency rules required six- or 12-months residence before receiving welfare or other assistance. Agriculture was rapidly mechanizing, and federal assistance was considered necessary to help farm workers and their children find nonfarm jobs. When mechanization slowed in the 1970s, seasonal workers and their children became eligible. Federal appropriations for 12 migrant and seasonal farm worker (MSFW) programs were over $1.1 billion in FY08, five percent of the $22 billion in labor expenditures reported by farmers in the 2002 Census of Agriculture. About 88 percent of MSFW funds went to the "Big 4" programs. A third of MSFW funds went to the Migrant Education Program and almost a third to Migrant Head Start, followed by $167 million for Migrant Health and $80 million for job training. 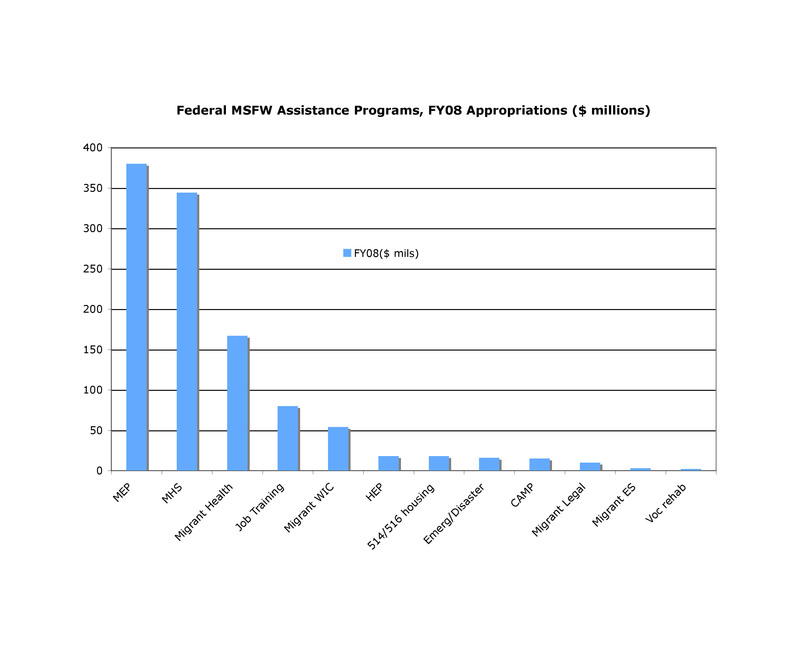 Other MSFW programs include the migrant women, infants and children (WIC) program, $54 million; USDA Section 514/516 housing loans and grants, $18 million; the high-school equivalency program (HEP), $18 million; emergency grants for MSFWs, $16 million; the college assistance migrant program (CAMP), $15 million; migrant legal services, $10 million; and migrant even start, $3 million. Some MSFWs are also eligible for services for low-income US residents.